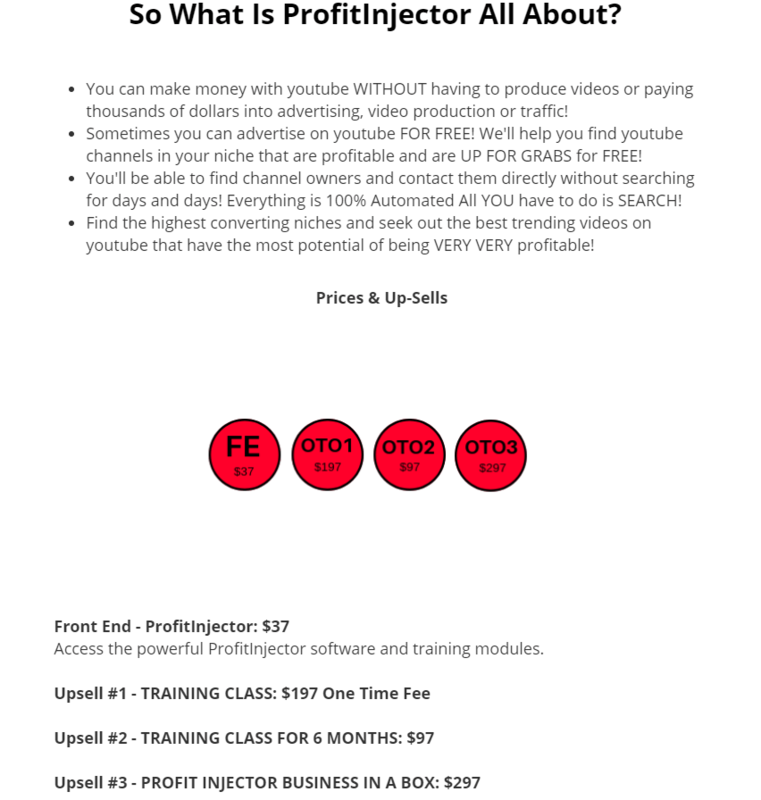 I was wondering about the quality of ClickBank Products recently, and I stumble upon one specific product – Profit Injector, by Jamie Lewis. I have heard a bit about his product but never actually reviewed. So I have decided to take a deeper look at what he has to offer. We will be looking at this product -> what might be there for you, if he offers any sort of support, how the member area looks like and most importantly the price. 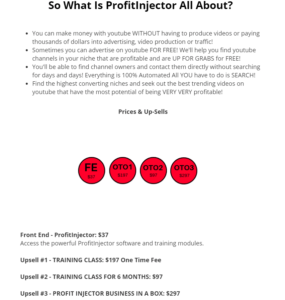 Jamie’s product is intended to help you earn a commission out of the ads you are placing at existing YouTube videos. We’ll be explaining how it works, below. In the advertised video Jamie says, how easy it is to ask somebody to place an affiliate link in his/her YouTube video, and that once you get your link there – Bum you start to earn. Reality is that it is really difficult to convince some “stranger” to put your affiliate link in his video. He can start to place the affiliate links by his own. *It might be just me, but I do really hate upsells. That is why I include them as part of the drawback. There are always many ways how to approach a specific product. To simplify this thought – you can either glorify that thing, or on the other hand you can disgrace it. If you glorify something, it looks suspicious and you should be careful and maybe step back and think about that. If somebody does nothing, but criticize, that is the other extreme. Where am I getting with that? I also read reviews, and when I see that the specific product does not have any disadvantage, it must be either perfect product or the review is bias. Well, we all know that nothing is perfect. So it must be only the last option. As Jamie says, the process of implementing the strategy is simple “Copy and Paste”. Second requirement is to have at least 2 hours for your self in order to learn this technique. Third requirement, is to send email to Jamie after you implement the strategies. So you will let him know how you are doing with it. Sounds pretty easy – at least from distance. He also says that there is only a limited time frame, so if you want to jump on this train, you should hurry up. Access is limited. No worries; That is just a marketing technique called – Scarcity. I can’t help myself, and I most likely I am going to be a bit bias here – If you see his video with all the cash lying around, well it is maybe only my opinion, but that does not look serious to me. When you buy some stuff on the internet, ain`t you pay by credit card? Or bank transfer? The merchant I believe receives the payment electronically as well, right? So Where all the cash is coming from? Withdraw from ATM machine? Maybe he does not trust banks, and if that is the case, then all right -> I can not blame him there. So back to the review. There is no doubt that with YouTube you can be very successful. YouTube has became #2 Search Engine. And if his product will turn out to be working well, you can really make some money. Even lot of money. So lets take a look what is inside the member area. What is Inside the Platform – Members Area. What Jamie sells, it is a software that helps you to find YouTube videos that has many views and are not monetized yet. For the price $37 you get into the members area with bunch of videos. Below You see the area with lots of niches, you can choose from. You select one of the niche, and you get list of videos related to this niche. Under each videos, you have option like “View Details” where you have properties of the video – Likes, Dislikes, Views, Duration … You are right – these properties are the same like you find on YouTube. Ideally you find the owner with already filled out the details – including the email address. You are going to email him saying that you have this offer for him. You have an affiliate link and you would like to use it in his/her video for monetizing purpose. And you can split the profit lets say 50/50. Imagine you are the owner of the video and you have not monetized the video yet. Well If I were the owner of the video, and I read about such an offer it might be exciting at first. But I do believe that many of the owners soon realize (within few minutes) that I can get the affiliate link on my own use it in my own video. So what would I share the income with some stranger. I would probably thank him and apply the idea. Jamie holds weekly live training classes where you can participate and ask questions. That is part of the 1st upsell, though. It costs $197 and the membership lasts 1 year. Theoretically this system might work but at the end it is not easy to find YouTube owner who would fall for such a partnership. Even if he might, I believe it is matter of hours until he realizes that he can do it alone without splitting the commission. Well, If there were any commission at first place. Because the percentage of people clicking on the link and buying stuff, is less than 2%. So in my opinion Jamie says A, but he does not reveal you the B. When I see such a hype talking at beginning, I tend to be skeptical. On top of that – that playing around with bunch of cash – well to me there is something sneaky. But I gave him a chance and did review on his product – to make sure that I have not missed anything. If you think I have missed something, you are more than welcome to ask me a question in comments area at the bottom. Thank you for this honest and unbiased review of the profit injector.i think the start up price is okay at less than$40 but my major concern is the upsells. I feel is a little bit exhorbitant and expensive. I won’t advise anyone to venture into it because am a bit skeptical about it mode of promoting products. You are right. Whenever I see an upsell, I feel dishonesty and tend to steer away. Unfortunately there many products based on similar price structure. This is an informative post. Kudos! 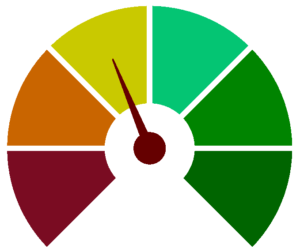 i have been an affiliate marketer with clickbank products for years, though i never heard about profit injector. it seems to be very cool to me though. I love the idea of just placing ads on existing You-tube videos to earn . Its good to also know that one does not really have to have an expert skill to be able to promote this product. Basic computer knowledge, ability to copy and paste and 2 hours to learn this is fair enough. The only draw back i see , in my own opinion is the challenge of having to partner with a You-tube content creator who has many views on his videos and has not monetized it yet. This alone i feel is hard-work though it is claimed that Jamie sells a software that helps to do the finding of these videos, but i still think its really tough partnering with a complete stranger. Thanks so much for this post. It has really being educative and i must say i have learned something new. Cheers! 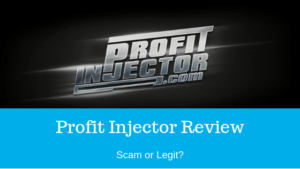 Profit Injector is a new product. Maybe only few months old. I am glad that my post helped. Also I have noticed another brand new product from Jamie, so I will take a look at that as well. The product you reviewed sounds like trying to make sales from nothing. The product isn’t yours, the platform to advertise on isn’t yours. The training you need to do well in the scheme is several layers of upsells. And like you, I really really really hate upsells. I think if 90% of the system relies on you upselling in order to succeed in it, then it’s a pie in the sky scheme. I’m flabbergasted that such programs exist. I’m flabbergasted that they’re able to get people to sign up for it. I’m grateful for reviews like yours to keep on in touch with what’s out there and what to steer clear of. I’ll be reviewing more products, so lets see what if there are any better ones. I’ve also wondered about clickbank products so I was interested to read your review of one. It sounds like an interesting product, Jamie has come up with an idea I’d never thought about. I find the pricing a bit confusing. What do you mean when you say it costs $37 but $44 is the total that comes out of your bank account? Thanks for your question Emily. What I mean by that, $37 is advertised price. But once you purchase the product you have to pay tax as well, so the total will be something about $44. I mean it is common thing that in US the prices are show without Tax, but in order to be transparent for EU readers I include the final price as well (which is $44). Hope it is clear now 🙂 Otherwise let me know please. This is awesome and i must say its an eye opener. 2. is there anyway we can get hold of these scammers and get them arrested probably through their address. That means, that they show you initial price, but they do not reveal the upsells until you sign up for their product. It is always recommended to do the research first to find out whether there are usells or not. Also when I see the initial video, where he glorifies his product as #1 in the market, and promises you that you can make money within few hours (or even days) – there I start to be suspicious. In worst case scenario, with these ClickBank products you can always ask for money back. I did it and it was no questions asked. And as for the 2nd question – you can report scams to FTC (Federal Trade Commission).